WHO I FISHED WITH: This morning, April 23rd, I fished with returning guests, father and son Matt and Mitch Laakso. This was a birthday trip for Matt, scheduled a full year ago as we concluded his birthday trip in 2018. We actually had to leave the fish biting at 11:35a this morning so Matt could make his 2:30p business flight for North Carolina out of Austin-Bergstrom airport! 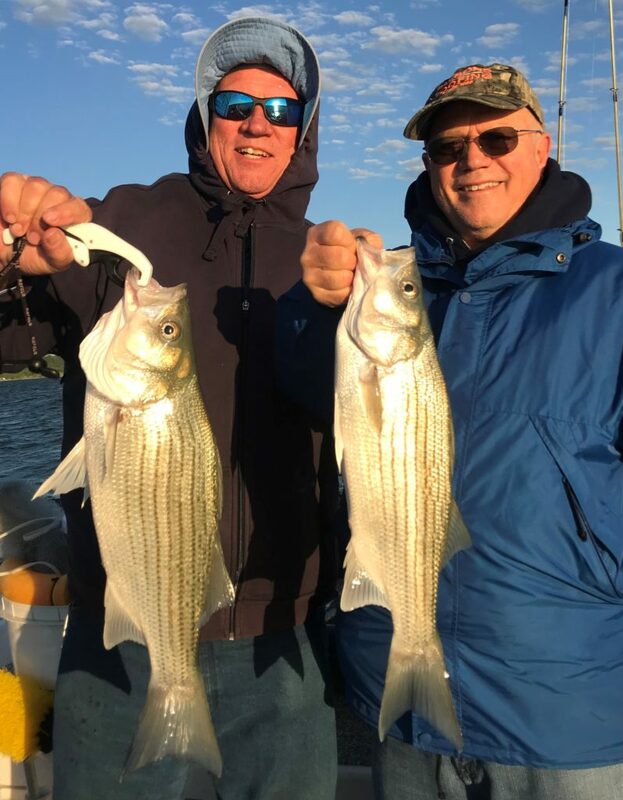 PHOTO CAPTION: Mitch Laakso (left) and his dad, Matt Laakso, with a late morning pair of hybrid taken just after the glassy-calm surface got rippled by a light easterly breeze. The fishing closely tracked with wind velocity today, allowing these two anglers a total of 17 legal hybrid, all taken on barbless circle hooks and all released in excellent condition. WHAT WE FISHED FOR: Hybrid striped bass using live shad. HOW WE FISHED: We fished live shad in pursuit of hybrid stripers for a full 4+ hours this morning. For the 3rd trip in a row (I believe on account of the unseasonably cool water temperature), we typically caught the fish we witnessed on sonar which led us to stop at the areas we fished, but we never got a “chain reaction” going via pulling in fish from around us, thus, we had to move frequently, even if just a few boat-lengths. Most of our fish came from 43-50 feet of water. Shallower areas had an annoying abundance of small blue catfish on them. We did best when the ESE wind blew, and noted a lack of action, or at least a lack of enthusiasm in the strikes we got, when the winds were calm. 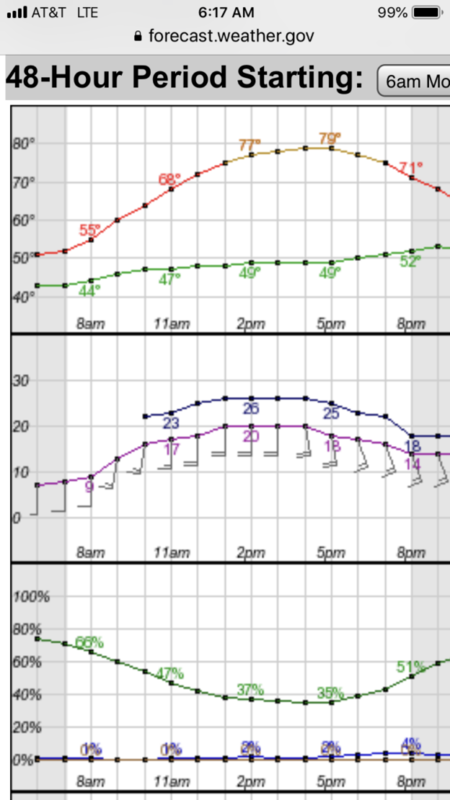 Our 2nd hour and final hour were best, as that is when we enjoyed the best winds. Unfortunately, we had to leave the fish biting at trip’s end so Matt could make a 2:30p flight out of Austin. OBSERVATIONS: The fish seemed to have no preference today on bait size. If the wind was blowing, the fish were active and they readily took whatever lively baits we sent down to them. Experimental cutbaits drew blue cat and zero hybrid this morning. TALLY: 37 fish caught and released – 17 legal hybrid, 4 short hybrid, and a 50/50 mix of white bass and blue catfish. 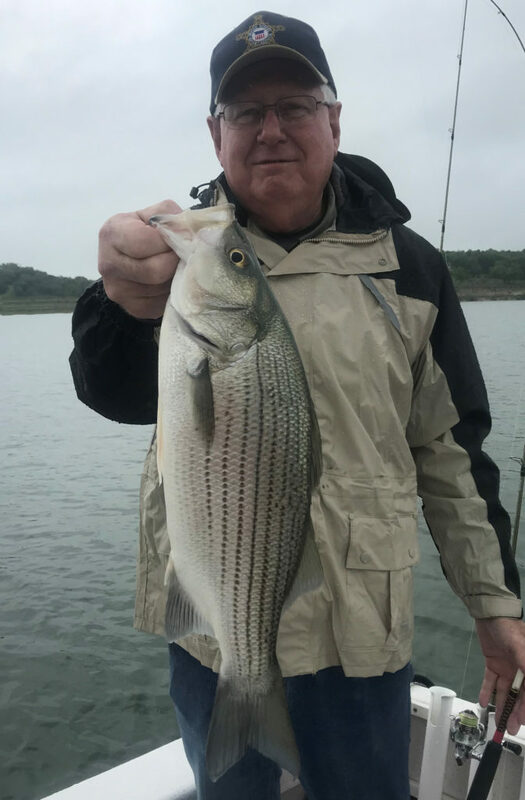 WHO I FISHED WITH: This morning, April 22nd, I fished with MJ Linder of Belton, his 80-year-old dad, Gene Linder of Abilene, Justin Hall and Justin’s 13-year-old son, John Hall, both from Gatesville. MJ owns Mobility Therapies, his dad is a retired college educator, Justin is a youth pastor in Gatesville, and John is in middle school in Gatesville where he’s currently playing 7-man Spring Football. PHOTO CAPTION: MJ Linder (right) and his dad, Gene, age 80, scored early on live shad. Our best bite came in the first two hours this morning. 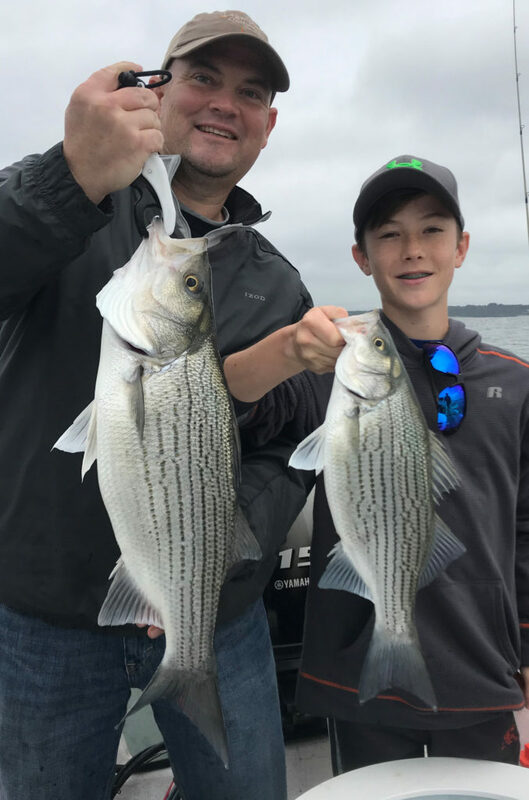 PHOTO CAPTION: Justin Hall and his 13-year-old son, John, took these fish just moments apart as an aggressive pack of hybrid passed into our bait spread and grabbed what we were offering. PHOTO CAPTION: Gene Linder landed our largest fish of the trip. This blue cat went for a cutbait we had put out for variety’s sake. It went 8.50 pounds on a certified scale. 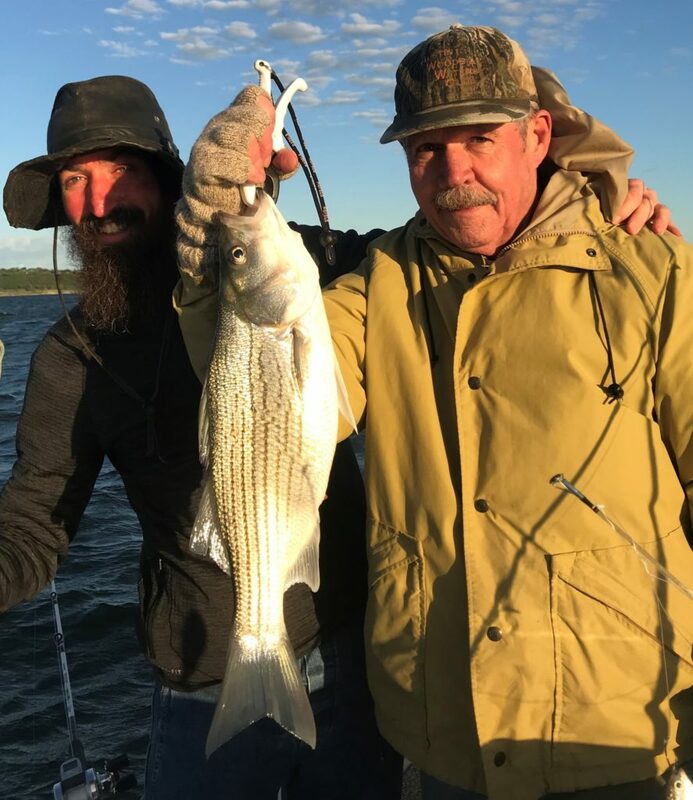 WHAT WE FISHED FOR: This was my first trip of the season devoted strictly to fishing for hybrid striped bass with live shad. HOW WE FISHED: Fishing was fair this morning, although I expected a bit better based on the wind speed, wind direction, and cloud cover. We fished live shad all morning and found the same scenario as I did last Friday — that when we pulled up on an area, we’d essentially catch what was there, but would not see fish pulled in from adjacent areas attracted by the commotion we made by thumping, with chum, nor by the frenzied movements of hooked fish. Thus, it was necessary to move soon after the bite tapered off. My conversation with one other Lake Belton angler confirmed this was happening elsewhere, as well. The first 2 hours of the morning was best. We got a lot of “lookers, not takers” in the last 2 hours of the morning; and this observation was confirmed by a fellow guide I checked in with after my trip had concluded. OBSERVATIONS: The later it got the more frequently we had disinterested fish inspect our baits without committing. TALLY: 34 fish caught and released – 15 legal hybrid, 3 short hybrid, 12 blue cat, 1 largemouth bass, and 3 white bass. WHO I FISHED WITH: On April 20th I fished with Jason Lange and his son, Andrew (age 16), and Will Sears and his son, Tyler (age 15). All four were first time guests and came after being high bidders on a gift certificate from a recent Central Texas Christian School fundraiser. Jason is a cardiologist with the Baylor Scott & White health system based at the Metroplex facility in Killeen where he works with Will’s wife, a gastroenterologist. Will is in the residential and commercial construction trade and runs Sears Builders and Development in Temple. Andrew still attends CTCS, and Tyler recently transferred to Belton High School. 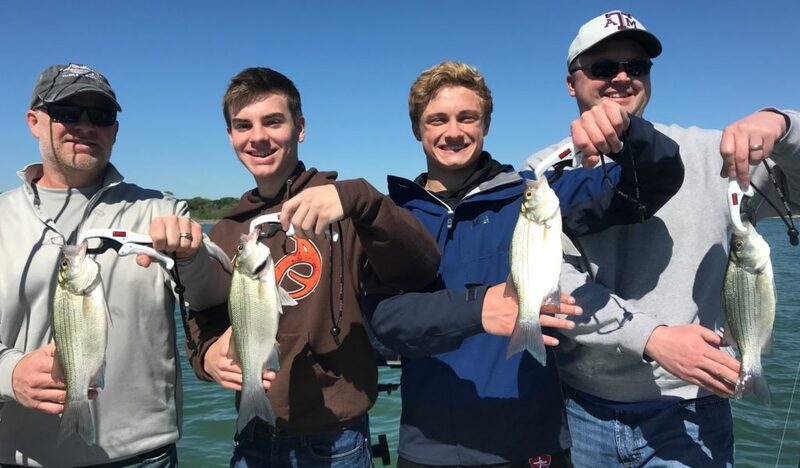 PHOTO CAPTION: From left: Will Sears, Tyler Sears, Andrew Lange, and Jason Lange, each with one of the 53 fish we landed in a 4-hour morning white bass fishing trip on Stillhouse Hollow. PHOTO CAPTION: 15-year-old Tyler Sears landed this 4.25 pound largemouth on a soft plastic grub on a 1/4 oz. jighead and on spinning gear intended for white bass. After quite a tussle, we worked together to slide the fish into the net, then did a little C-P-R (Catch – Photograph – Release). WHAT WE FISHED FOR: This was a multispecies trip focused on white bass. HOW WE FISHED: This very clear, cool morning, we began working up shallow first under low light conditions throwing soft plastic paddletail grubs on 1/4 oz. heads to white bass hanging on shallow flats. 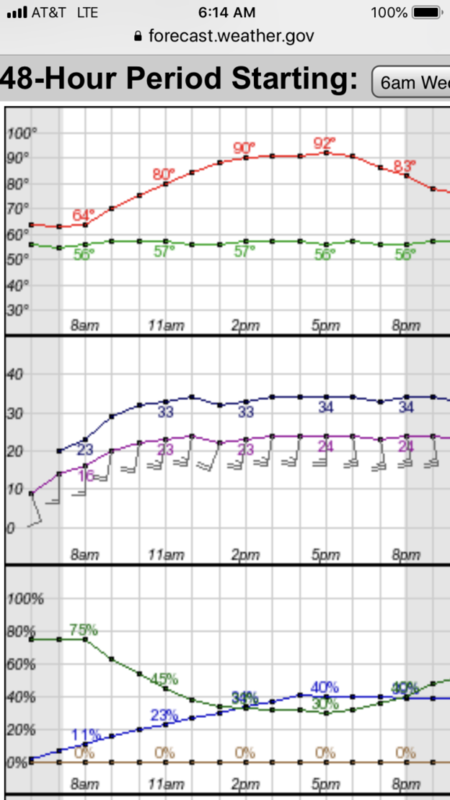 As expected under post-frontal conditions, the bite was hindered a bit by the bright skies and relatively calm winds. We experienced a slow, steady pick of fish through about 8:40a, when the shallow bite died for keeps. We landed 15 white bass, 1 crappie, and 2 largemouth during this bite. We immediately headed for deeper, clearer water and searched a number of potential fish-holding areas for fish. When we found a few fish, I introduced everyone to LiveScope-assisted vertical jigging with 3/8 oz. Hazy Eye Slabs/Stingers. Everyone really seemed “wow’ed” by the demo I provided (which resulted in a landed white bass which came racing about 25 feet from off the bottom in 40′ to grab my slab). From that point on everyone stayed engrossed in properly working their baits so as to capitalize on interested fish. Due to the post-frontal conditions, the fish were somewhat reluctant, but the time from 10:00 to 10:30 produced well thanks to the peak wind conditions we enjoyed during that span. We ended up catching 35 white bass via vertical jigging, thus taking our tally to 53 fish. 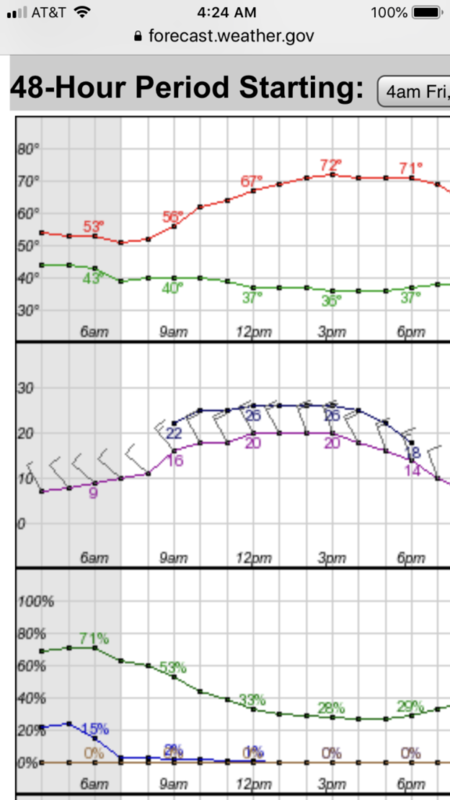 OBSERVATIONS: Thanks to 2 solid days of high winds, the upper 1/3 of Stillhouse was siltier than I care to fish; I believe this impacted our bite from fish accustomed to sight-feeding. WHO I FISHED WITH: This morning, April 19th, I fished with a contingent of the Oliver clan, including brothers Joe, Jack, and Jamie, as well as Joe’s son, Thomas, and Jack’s son, Isaac. This was all part of a 30-person reunion to take place over the Easter Weekend, with “Pa” Oliver’s place in Temple being ground zero for the festivities. 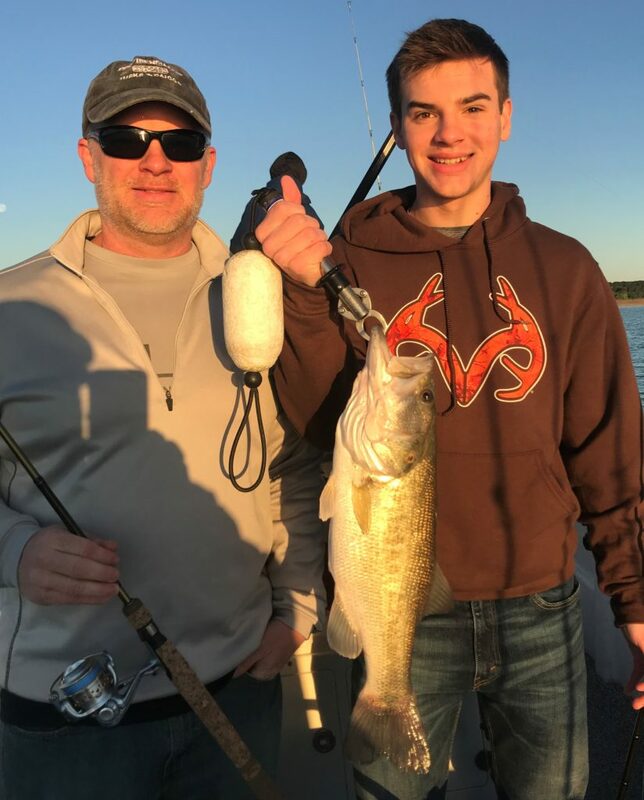 PHOTO CAPTION: Brothers Joe Oliver (Temple, TX) and Jack Oliver (Marble Falls, TX) with a nice pair of hybrid taken on live shad just seconds apart. PHOTO CAPTION: Jamie Oliver (Cedar Park, TX) with his nephew (Joe’s son), Thomas Oliver (Temple, TX) with one of the 21 legal hybrid we took under incoming cold front conditions. PHOTO CAPTION: Jack Oliver and his son, Isaac Oliver, with our heaviest hybrid of the trip which tipped the scales at 5.25 pounds. HOW WE FISHED: Based on recent results and the forecast weather conditions, I was concerned that a morning of solid hybrid fishing might not be in the cards for us, but, thanks to some overnight cloud cover, more heat was retained overnight allowing for a sunrise air temperature of 57F versus 50F called for by the weatherman. Additionally, there was a brief, but intense, pre-sunrise shad spawn thus confirming to me that the cold front didn’t do the damage it could have. 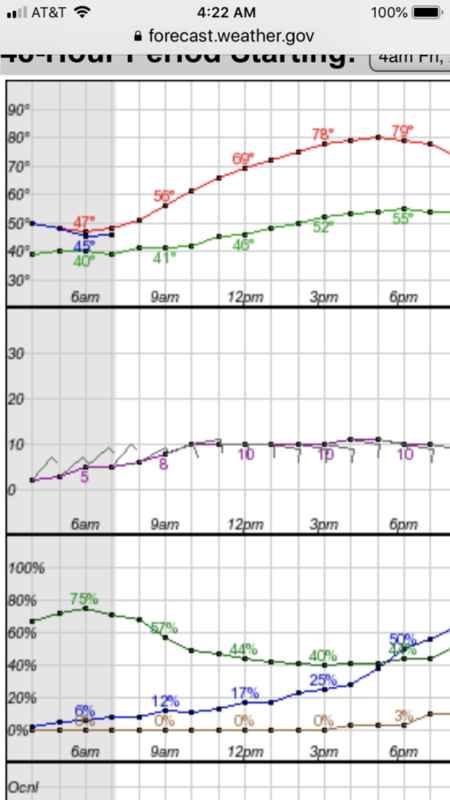 Additionally, the winds from this cold front were still blowing, so we were not in post-frontal conditions. We got on a solid hybrid bite for our first 2.5 hours on the water, putting 21 legal hybrid, 2 short hybrid, 1 blue cat, and 1 largemouth in the boat during this time. The fish were not really fired up. We caught what I saw on sonar as we Spot Locked, but did not really pull in additional fish from nearby, hence, we had to “short hop” or “jog” a bit to keep getting bit. Eventually, the forecast winds built to the point where our bait rods were moving vertically too much in the swell, and we headed for more protected waters. Over our last hour on the water, we put 35 white bass, 1 drum, 1 blue cat, and 4 short hybrid in the boat, all on 3/8 oz. white Hazy Eye Slabs with Hazy Eye Stinger hooks affixed to the line tie. OBSERVATIONS: Brief, intense shoreline spawn by threadfin shad at Area from 6:45-6:55a, also noted spawners at Area 1367 and SHAD002; James C. reported 3 hours of spawning at his location the day before from about 30 minutes pre-sunrise and hence. 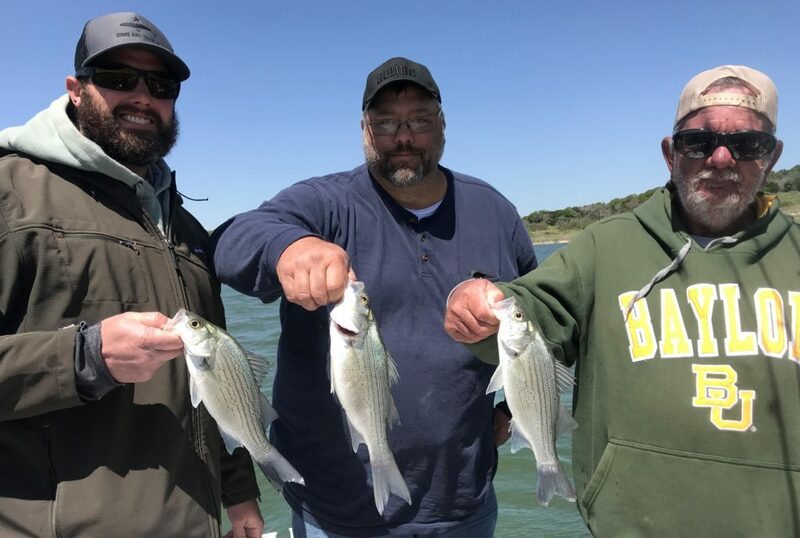 This was the first trip in this 2019 season with a mix of both quality and quantity concerning hybrid striped bass. TALLY: 66 fish caught and released – 21 legal hybrid, 6 short hybrid, 2 blue cat, 1 drum, 1 largemouth bass, and 35 white bass. WHO I FISHED WITH: This morning, April 17th, I fished with Jerry Worley and Jerry Blalack, both of Harker Heights. The two men got to know one another when Jerry W., owner of Jerry Worley Insurance Agency, helped Jerry B. out with homeowner’s insurance. PHOTO CAPTION: Jerry Blalack of Harker Heights with a Lake Belton hybrid taken on live shad. The hybrid bite is just now coming around after an unusually late start thanks to an unusually cool spring and very frequent cold fronts moving through making the fishing tough. 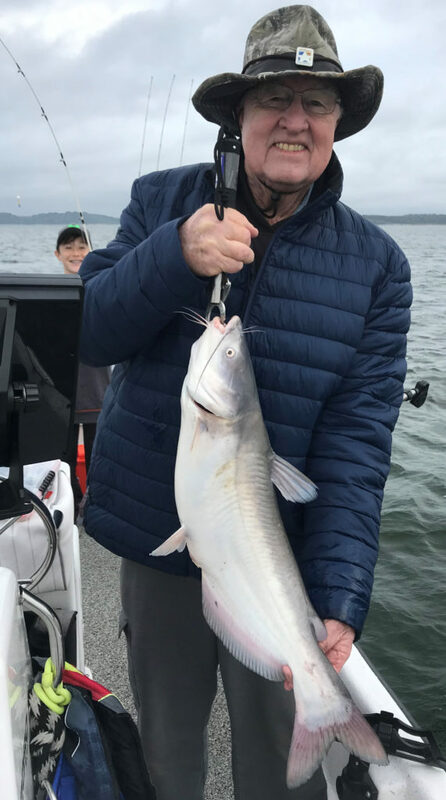 PHOTO CAPTION: Jerry Worley, owner of the Jerry Worley Insurance Agency in Harker Heights, with another bait-caught hybrid going between 4-5 pounds. Our last two hours was better than the first half of this morning’s trip. HOW WE FISHED: This trip broke down into 3 parts. Part 1 was a largely unsuccessful bait fishing effort targeting hybrid which resulted in just a handful of fish, none of which were hybrid. We then took about an hour and a half in the middle of the morning to get our strings stretched by targeting white bass. 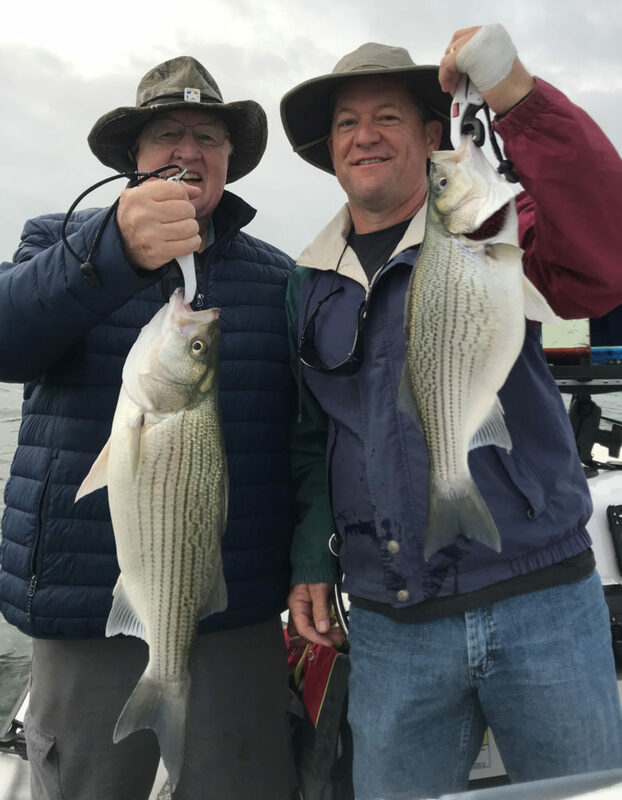 As the trip closed out, and knowing that the white bass were still active based on both our results and sonar returns, we once again hung bait to see if we could interest a few hybrid stripers. This was the first time this Spring 2019 season I saw any rhyme or reason to the hybrid activity I observed — that’s promising! OBSERVATIONS: The shad spawn appears to be making its way down the tributaries. Zero bird activity seen. Light topwater feeding action observed under less windy, rainy conditions towards trip’s end. Sky Conditions: 100% murky grey clouds the entire time with drizzle the last 75 minutes prior to post-trip clearing later in the day. WHO I FISHED WITH: This morning, April 15th, I fished with new clients Jonathan Blauvelt and his fiancee, Gloria Rodriguez. The two met at a Starbucks while Jonathan was on active duty and Gloria was grading papers while she was teaching in the public school system. They are due to be married at the Cadet Chapel at West Point, NY, in July of this year. Jonathan is a Class of 2005 graduate of the U.S. Military Academy at West Point, and is thereby part of the “Long Grey Line”. He served as a commissioned officer in the Signal Corps. Gloria is from McAllen, TX, graduated from the University of Texas – Rio Grande Valley, and currently works for the Nolanville Economic Development Corporation. 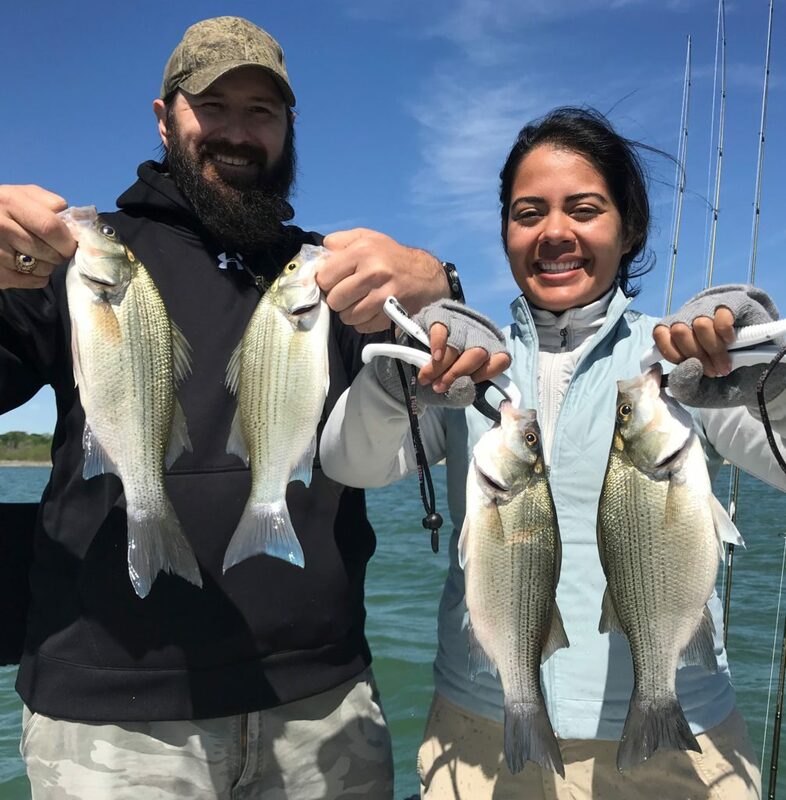 PHOTO CAPTION: Jonathan Blauvelt and Gloria Rodriguez, each with a pair of white bass from among the 104 we caught on the first day of decent fishing weather we’ve enjoyed in about a week’s time. HOW WE FISHED: We finally got a day’s worth of weather I could get excited about and, evidently, the fish were excited about it, as well. 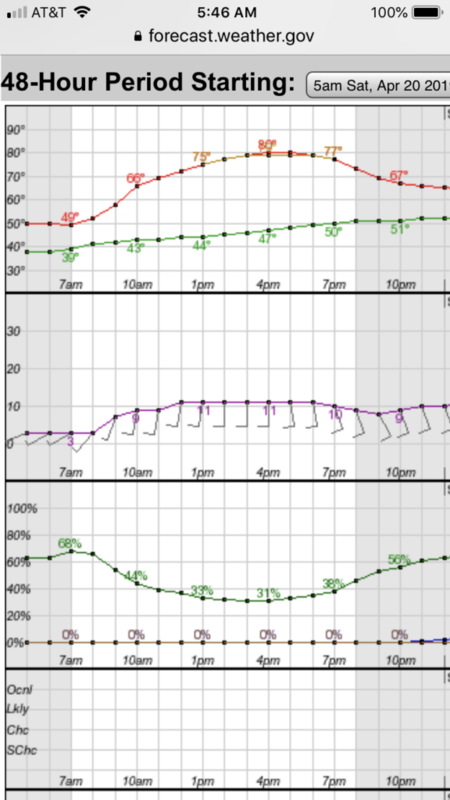 The overnight lows did not drop down as low as were forecast (only dropped to 55F), and a southerly breeze was already moving the water before sunrise. We enjoyed consistent action on white bass willing to take paddletail grubs on 1/4 oz. 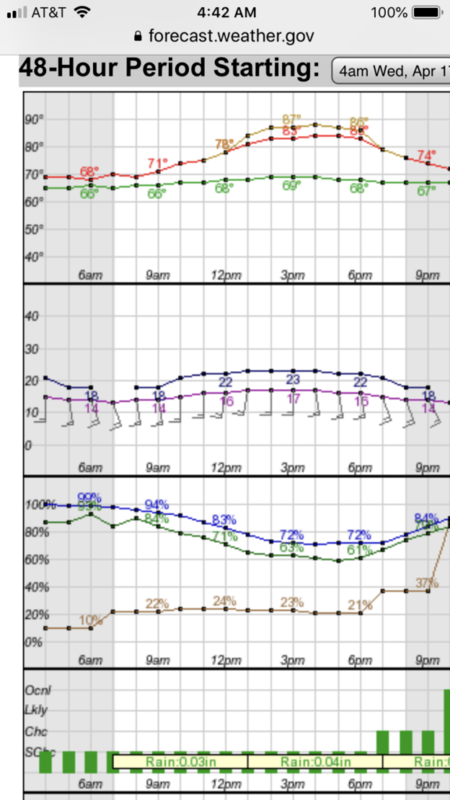 jigheads from 7:00am through 8:35am. These fish were feeding on shad on a flat in under 12 feet of water, although there was very little surface action to give away their presence after the sun rose. We landed 41 white bass during this low-light feed. We had a bit of a lull from 8:45 to 9:30 as the sun continued to rise and brighten the cloudless sky, and before the wind built up enough to create wave action. By 9:30 enough wind had worked on the water long enough to help the open water bite develop. I checked 4 areas before finding fish at a fifth area. The action built nicely after we fooled the first 2 or 3 fish into biting, and we stayed on these fish at this one spot without short-hopping a single time all the way until 11:15. We relied heavily on the Garmin LiveScope technology to keep our baits in front of the fish regardless of the depth the fish were using. Most of the action took place in the lower 1/3 of the water column as we sat in 32 feet of water. We landed 63 white bass here, all on 3/8 oz. Hazy Eye Slab/Stinger combinations in white color. OBSERVATIONS: No gulls seen. Working ospreys helped identify general fish holding areas, but not as precisely as gulls would have. 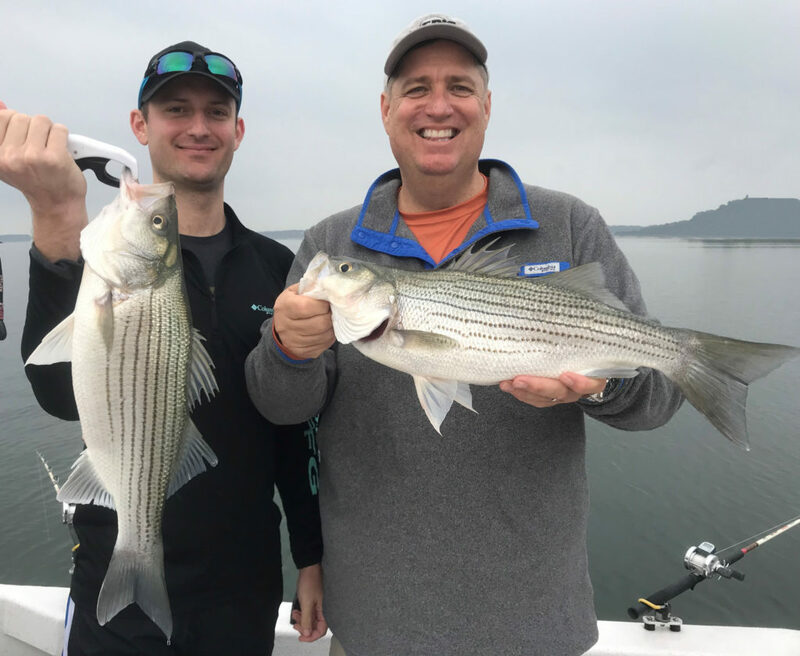 WHO I FISHED WITH: This morning, April 12th, I fished with long-time clients affiliated with Pride of Texas Irrigation & Landscaping, including the owner, Justin Pride, former employee and friend Brian Badour, and business associate Ricky Guenat of the Pulte Group. The trip was coordinated by Rob Ramey, an employee of Pride of Texas; Rob couldn’t make it because his step-daughter made it to the finals in high school soccer and the family headed to McAllen to watch her play (where they won 12-1!!!). 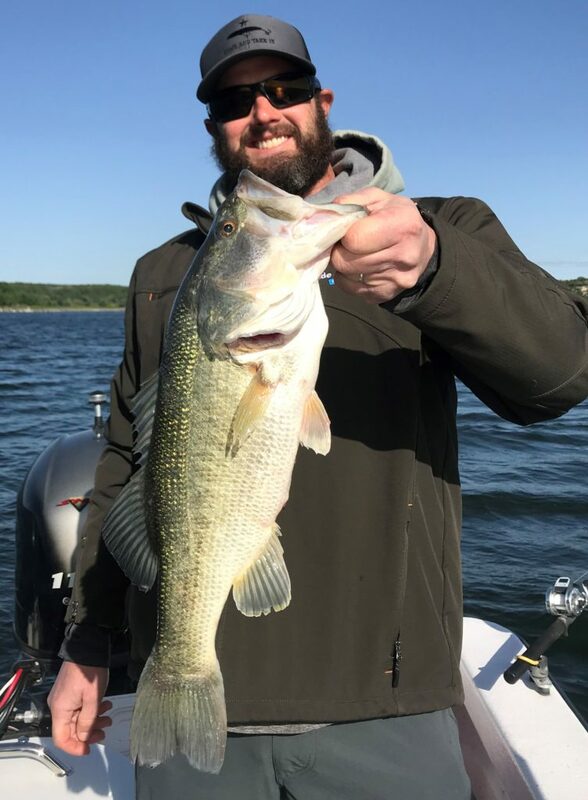 PHOTO CAPTION: Justin Pride, owner of Pride of Texas Irrigation & Landscaping, with a sweet Lake Belton largemouth bass that took a large, live threadfin shad in 41 feet of water. 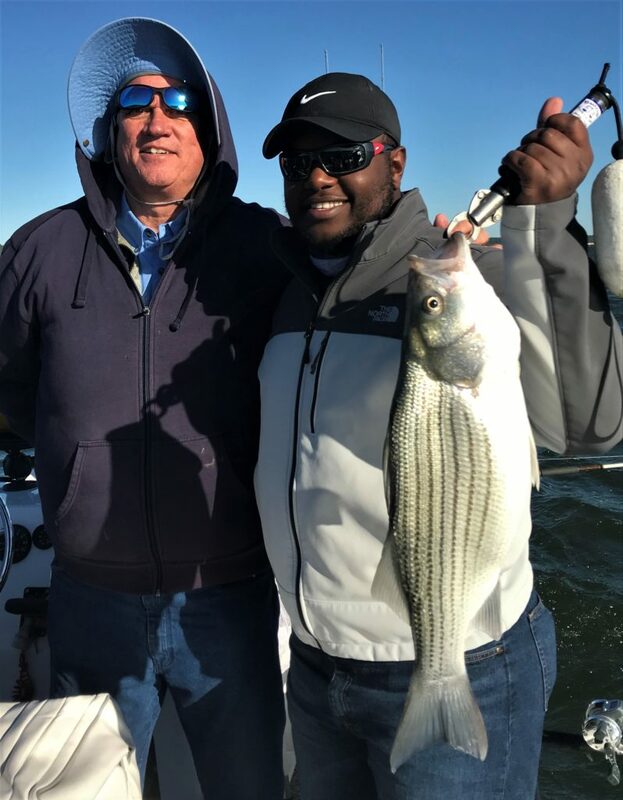 PHOTO CAPTION: Despite the post-frontal conditions, the east wind blew hard enough, long enough to stir up a bit of white bass action right around 11:15am. We landed 31 fish in our final hour or so on the water. The fish responded to smoking and then snap-jigging as we used 3/8 oz., white Hazy Eye Slabs/Stingers. WHAT WE FISHED FOR: This was a multispecies trip in which we used both artificial and live baits. 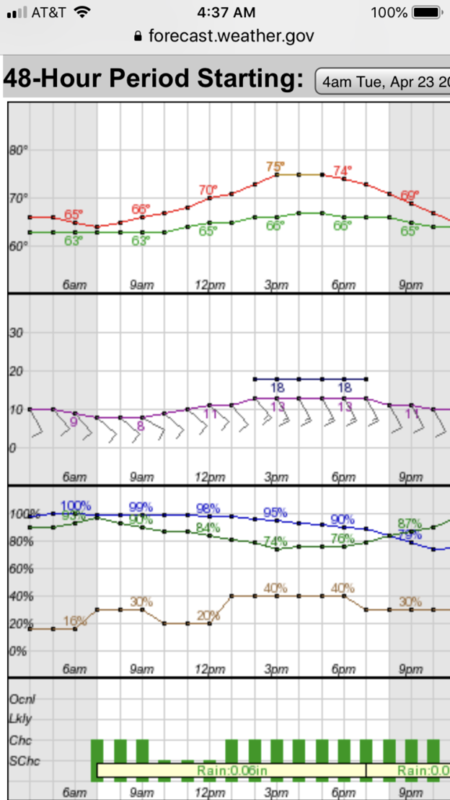 After a great morning of pre-frontal fishing yesterday, this morning we awoke to post-frontal conditions. Yesterday’s NW winds brought clear, calm, cold conditions overnight, dropping the ambient air temperature to 44F before sunrise this morning. Then, an ENE wind slowly kicked in. Seeing all of this developing while keeping my eye on the forecast, I suggested we reschedule this trip, but my crew simply valued the downtime, fish or no fish, so we pressed on with our plans. Fishing was predictably slow with scattered, suspended fish that just were not interested in much. We contacted white bass in two locations, one at around 7:45a and the other at around 11:15a. The first school was loosely congregated about 2-3 feet off bottom, and the second was much more dense and aggressive, with far more individuals in that school. The first school required a snap-jigging tactic, while the second school was active enough to go for a smoking tactic. Once the initial surge of interest waned, we reverted to snap-jigging to add another 10 fish to the tally. 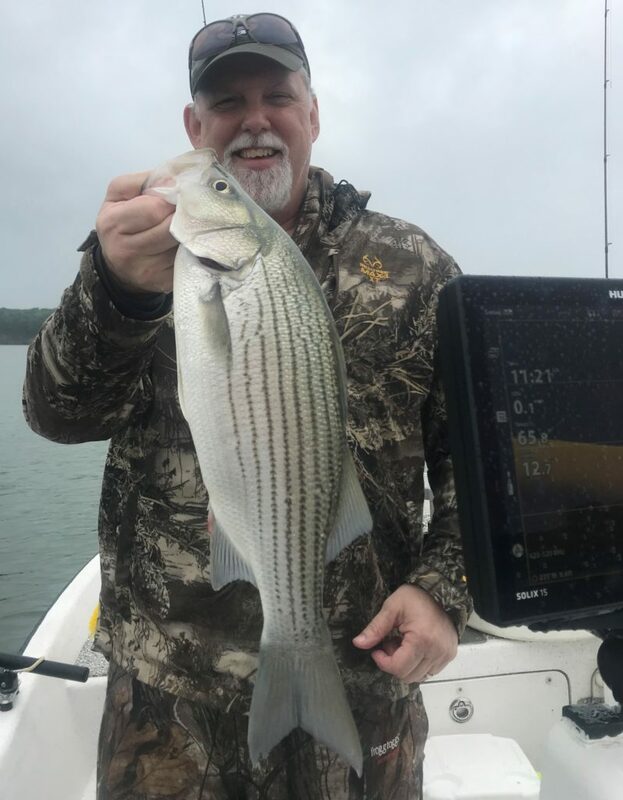 Most places we went we slabbed on one side of the boat and I hung bait out the other side, but the interest in live bait was nearly non-existent this morning with only 2 white bass and 1 largemouth (out of a total of 41 fish) taken on shad. OBSERVATIONS: Very few birds witnessed on Belton other than black-headed gulls forming up to migrate. If you know me or have fished with me, you’ll know I’m a stickler for maintenance. My vehicles, boat, rods & reels, lawnmower, etc. all look good, run well, and last a long time because I’ve developed a disciplined approach to maintenance. As our 23rd wedding anniversary approached in July of 2018, I considered what level of maintenance I was putting into my marriage with Rebecca. Long story short, as part of our anniversary last year, I signed us up to go to our first ever marriage conference/retreat put on by Family Life in the Arboretum district of Austin. This organization took a very God-honoring, biblically-sound approach to the topic. Another long story short, one of the action items that resulted from attending this 2.5 day conference with Rebecca was that we both decided to dedicate one day a week (Thursday) to being with one another. No guided fishing trips, no church work, no individual appointments with others. Since I retired 3 years ago, and since Rebecca works part-time at our church’s nursery, this is very doable in this season of our life. Today was an especially enjoyable Marriage Maintenance Thursday. I woke at 5a, and Rebecca at 6a, we ate breakfast and were out the door by 6:30a and on the water by 6:45a. 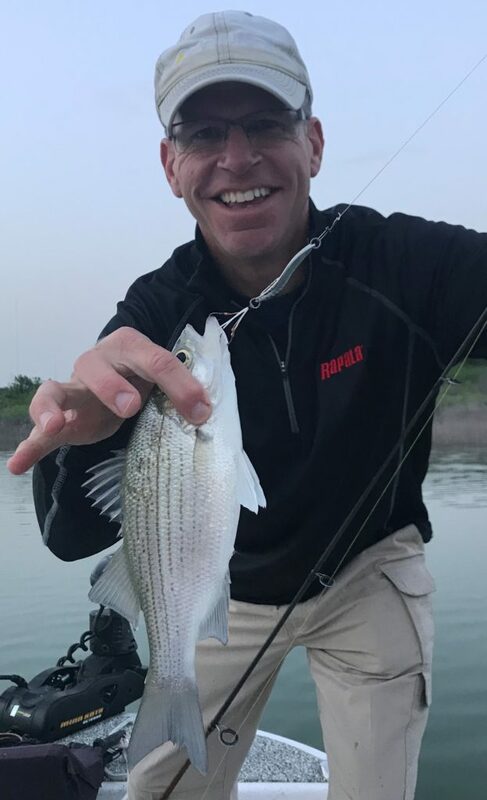 Between 7:07am and 9:07am, I caught exactly 70 fish from an aggressive near-surface feed by white bass on Stillhouse and then left them still biting to continue our day. After a quick nap, a visit to Kohl’s and lunch at Freebirds, we headed to Mountain Creek Range, a very well-run and affordably priced indoor ranged on Hwy. 195 between Killeen and Florence. We sharpened up our .22 caliber handgun skills on paper targets and then headed to Target in Harker Heights to do some birthday shopping for a relative. Yes, the getting up early to fish was a bit of a sacrifice for Rebecca, and walking through the doors of Kohl’s and Target (or any retail establishment other than Bass Pro Shops, Cabela’s, or Academy) was a bit of a sacrifice for me, but, that is a lot of what marriage maintenance is all about. Dinner followed around 6:30p at home. Along the way today we got to talk about our short- and long-term plans, about work, about our parents (who are total blessings to us), about our extended family, about our relationships with others and with the Lord, and more. It was a great day with a great person with some great weather, to boot. CATCH LOCATION: Area 1697-1724, all in <14′. 70 fish in exactly 2 hours’ time. 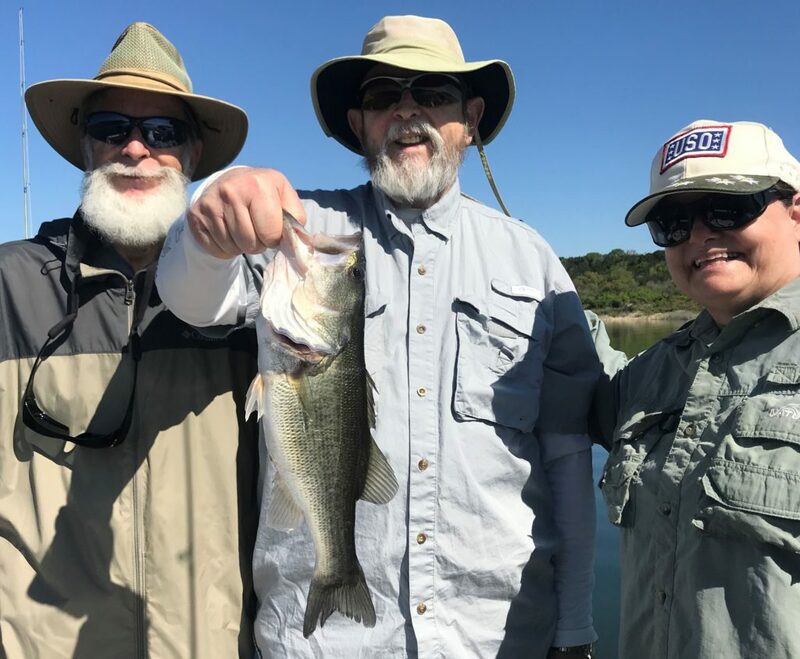 WHO I FISHED WITH: This morning, April 10th, I fished with old Army buddies George Harmeyer and Bruce Overbay, and their wives, Phyllis and Melissa. George and Bruce first met as lieutenants during the Vietnam era. George was already stationed in Germany and Bruce was just arriving when an “alert” caused their paths to cross; the two have been friends ever since. Bruce retired from Exxon a few years ago, and he and Melissa now roam the nation in their motorhome. George retired as a major general (2-star), lives with Phyllis in Harker Heights, and is involved with the “Warriors Afield Legacy Foundation” with sponsors several outdoor events each year for wounded military personnel. 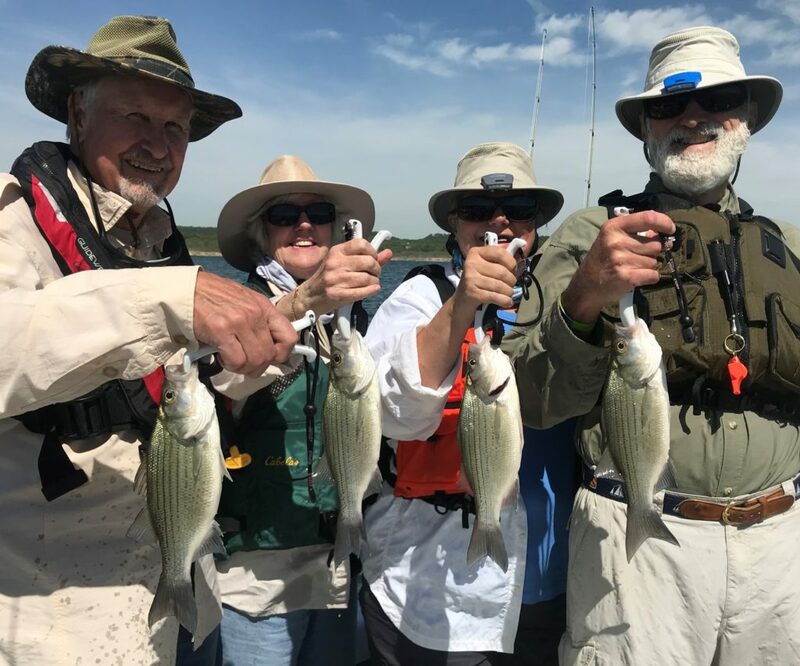 PHOTO CAPTION: From left: George and Phyllis Harmeyer, and Melissa and Bruce Overbay with a few of the 34 fish we landed on yet another tough weather day. HOW WE FISHED: This trip broke down into two distinct components. The first action we experienced came right off the bat as white bass drove shad through the water column and to the surface thus giving their position away by the commotion they made as they fed on shad over a shallow flat under calm/light ripple conditions. As the ladies learned to cast spinning gear, they got through the learning curve quickly and were routinely landing white bass on Cicada bladebaits, as were the fellows. That spree lasted about 75 minutes and gave up 21 fish landed, with several others missed. We then endured about a 2-hour slow period during which time the wind remained light, ultimately to begin blowing from the SSE at 13-14+ mph by around 10am. 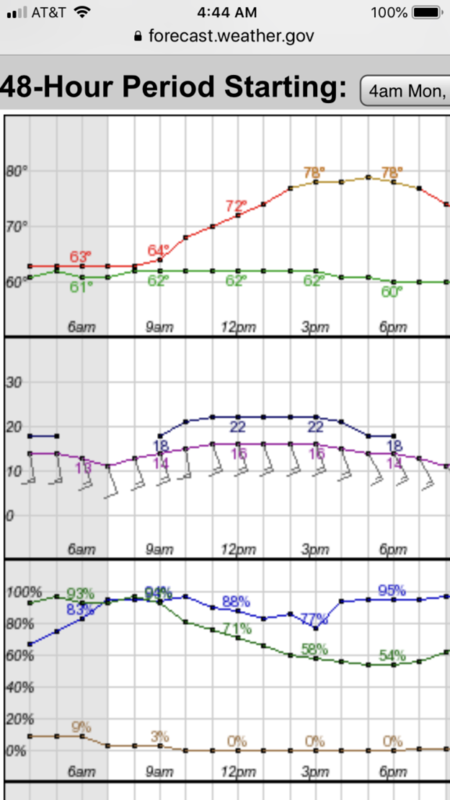 By mid-afternoon the winds were exceeding 22mph straight-line, with higher gusts. Once this wind had worked on the water for a bit, we checked a wind-impacted underwater point in about 34 feet and found the bait and fish we had been searching for. Using LiveScope technology, we very accurately presented baits to individual, suspended fish and put another 13 fish in the boat with a few more missed before the bite subsided around 11:30am. The lure of choice here was the 3/8 oz. Hazy Eye Slab/Stinger combination.